Need a Charismatic and Captivating Speaker? Lyn Christian is a dynamic and captivating speaker who engages and inspires the audience. Her ability to authentically connect with the audience results in the audience taking action in their lives. As the former Director of Innovation at Franklin Covey Coaching and former ambassador for the World Association for Business Coaches, Lyn uniquely bridges the gap between tradition and innovation. Lyn's visual thinking, in-the-trenches experience, and unbridled passion and enthusiasm make Lyn the channel who hands you the very words you need when you need to hear them. Lyn, I have to say this was the most impressive speech we’ve ever had here at work. I usually snooze through these events and today…well you inspire me beyond words. Thank you! 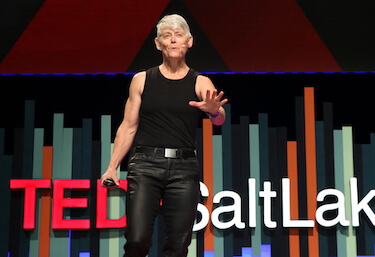 Lyn speaks on topics related to leadership, time management, career reinvention, and how to find your purpose and live a badass life. Lyn will customize her presentation to meet your organization’s specific needs. The goal of each presentation is to facilitate the outcome you want to create. Lyn's most requested topics include the following. Keep in mind that she can present these as a keynote or a workshop. 1. Be True. Be Strong. Be Focused. Enliven and Enlarge your vision of who you are and what you can achieve. This stirring keynote blends three timely and applicable strategies with a cluster of metaphorical, real-life applications. Set against the backdrop of Lyn Christian’s encounters within the crucible of elite Gym Jones from which she has adventured into competing in Sprint Triathlons…after the age of 50. This hour-long keynote is sure to inspire and inform almost any group. This is one of Lyn’s most popular and practical presentations. Her years working for Franklin Covey helped her see how critical it is to be constantly honing our time and focus management skills. Leaning into what Neuroscience tells us about how human behavior and blending that with the art of personal productivity, Lyn’s presentation offers solid strategies that get results fast. Every business and non-profit endeavor has a unique fan club: a group of believers who believe in what you stand for. When approached properly, you spend less time trying to capture new customers, and more time connecting with your super fans. Set against the backdrop of Lyn Christian’s encounters within the crucible of elite Gym Jones, from which she has adventured into competing in Sprint Triathlons … after the age of 50. Lyn’s presentation was insightful, engaging and most importantly made a lasting impact on our leadership team. Lyn delivered exactly what we were looking for – a keynote speech that provided practical insight into how to more effectively promote cohesive and decisive leadership in an environment of turbulence and change. Our team will ensure to provide a prompt and professional responses to your phone calls and email correspondence. Phone consultation prior to the event to ensure Lyn understands what you want. Announcements and mention on the SoulSalt blog and social media channels. A dynamically delivered presentation focused on achieving the outcomes you want. Immediate follow-up after the event to ensure we met your expectations and needs. One of the best things about Lyn is that when she speaks, she gives simple and actionable steps that allow the audience to see the immediate benefit. It's rare to have someone so clear, fun, imaginative, and brilliant! You can take the next step by contacting us below to check Lyn's current availability. Just click on the orange button below. Someone on our team will happily respond within one business day. Thanks again for considering Lyn for your event.